I don’t know how it happened, or who is responsible for putting me on such a politically perverted mailing list, but I have recently received an invitation to join the American Civil Liberties Union. Naturally, I reject such an invitation outright. Far from being the even-handed organization seeking to redress legal greivances that it was originally intended to be, the modern ACLU is little more than a sounding board for the American Left. And the letter that accompanied a request for a donation to join this crew dripped with partisan rhetoric. This could easily be a campaign letter for any Democrat candidate for public office. And if you read it in full (Don’t worry, I won’t torture you with the gory details), you’ll see that the ACLU pretty much justifies their existence as the antithesis of the Bush administration and everything it is doing to protect the country from radical Islamic fundamentalists. Why they’re poisoning my mailbox, I have no idea. When the most recent unemployment data was released earlier in the month, it had shown that the United States unemployment rate was 5%. In an economy as large as ours with a population as big as ours, a 5% unemployment rate is not only amazing (5% is generally considered to be full employment for a country) but is half of most other developed nations like France and Germany. When the U.S. had fallen into a brief recession after the .com crash U.S businesses from small to large were quick to go into layoff mode. The move caused our unemployment rate to rise but was necessary so companies could make their businesses more efficient during times of difficulty so they can be in a better position to stay in business until good times come again. It’s the old saying; sometimes you need to take one step back so you can take two steps forward. Sure enough over the last three years as the economy has come out of its recession, U.S. companies were quick to start hiring again, reflecting the improvement in their bottom lines. As company profits improved they moved quickly to add to their labor force so they could maximize production and the business opportunities presented. Like the U.S. other countries like France and Germany have also seen their economies accelerate and decline and most recently accelerate again. However in the case of France and Germany, their unemployment rates have continued to hover at around 10% (9.7% for France and 11.5% for Germany) even when their economies have shown signs of improvement. On the surface it may appear that those European companies don’t have the ability to increase their labor force but in actuality that is not correct. The truth is that companies located in France and Germany do not want to increase their labor force even though doing so would increase production and most likely profits at times when their economies are doing well. The reason, unlike the U.S., France and Germany don’t increase their labor force when times improve is do to one word, flexibility. Because of our belief in the free market system and very little union exposure companies in the U.S. can hire and fire quickly to take advantage of the current environment. In the case of France and Germany because of unfriendly labor laws and a large union presence companies don’t hire even when the business environment is telling them they should. The reason is companies know that if they are to hire someone, if the environment turns and goes negative they are basically stuck with that person on their payroll so companies would rather forgo profits in the present to save larger losses in the future. It is our labor flexibility that has seen U.S. GDP growth surpass 4% in the latest global expansion that has taken place while France and Germany have only seen roughly 1% GDP growth. It’s not that Germany and France are not capable of better growth it’s just that because of strict labor protection, companies won’t invest the capital necessary to attain it. I bring this up because of the debate we have been having regarding the benefits of unions. As I mentioned yesterday, if we look at the industries in this country that have had the biggest problems it is the airlines and auto companies, which are burdened with large expensive unions. Interestingly if we look at the one airline that is economically the most solvent, productive and profitable, it is Jet Blue, which coincidently doesn’t allow its employees to unionize. One-thing unions and strict labor laws don’t do is give companies labor cost-controllability. The only thing that give companies the ability to adapt to the environment is the flexibility of knowing you can change your pay, benefit and size of your labor force at anytime, something contracts don’t do and why our economy accelerates quicker and greater than others. In the end we can look at the issue of having a union legally as our President Dennis did and justify their existence. However if we view the idea of a union economically for the benefit of not only the underlying business but also economy in the form of GDP growth, we see their existence is not justified. Sure layoffs aren’t fair but giving companies the flexibility allows our economy to take those two steps forward and everyone else better off in the end, unlike strafing from left to right like they do in Europe. It’s just a matter of having faith that the “invisible hand” of capitalism makes it all work out in the end. My head is still shaking over your comments. In your final three paragraphs I couldn’t help but notice your belief that the workers of America are somehow not being treated fairly or paid sufficiently enough because of the exploitation by their employers. Yes in the early days of the industrial revolution there was obvious signs of exploitation and unions helped bring it to the attention of government but that has all been taken care of thanks to hundreds of labor laws that hang in our break rooms. Unions today with nothing left to solve have been left to become the exploiters of the free market system. One of the biggest problems that capitalism faces is the non-believer’s who walk the earth. We must understand that the price of goods do not set wages, it is wages that set the price of goods. Companies charge more for goods in New York then they do in Ohio because they can. Companies pay their employees more in New York then they do in Ohio because they have to. Further employees do not need to form a union to “balance the power” of the employer. First the employer should hold most of the power since it is their capital at risk. Secondly the employee has more power than you think through actions that don’t require a contract. Their moral, their willingness to leave and find another job, how they treat the customer, internal theft of company goods, which all effect the profitability of the company. By default it is in the employers best interest to make sure their employees are satisfied, attempting to exploit any worker is bad business and against the employer’s self interest. This is why the large percentage of jobs even those at the smallest level are paid above the minimum wage. My wife pays no one at minimum wage, even 18 year-old cashiers, because the market won’t allow it. In fact countless economic studies and models have shown that the implementation of minimum wage laws by the government and the existence of unions actually increases unemployment do to the violation of the equilibrium model of the labor market which believes wages adjust to balance labor supply and labor demand invisibly. When a government or union raises wages above equilibrium wages it reduces the quantity of labor demanded resulting in increased unemployment. In the end much of this requires a sense of faith that Adam Smiths “invisible hand” that runs throughout our economy works today as much as it did in 1776. Nice points except you fail to realize that every company in this country without a union is able to accomplish the same things. There is nothing you list in your points that the MTA can’t get without a contract. 1. As someone who manages pensions, I can tell you that companies do not have to give their employees a contract to get vesting periods for their employees on their pensions. I have dozens of clients who have pension plans both defined benefit and defined contribution that don’t give their employees contracts. Federal pension laws have certain vesting schedules in place for all types of plans, which are decided in the original plan document when the plan is set-up. An employee contract is not necessary to set-up a pension or to make it attractive enough to make the employee stay. 2. As far as a “steady stream of trained labor for a unique position”, again you can refer to any job in the country. Is my wife who is a district manager for a major retail company in Manhattan, not a “unique position”? She doesn’t have a contract nor is her company without a steady stream of trained labor since they follow the normal path of development for all employees from top to bottom that every company without a contract for its employees follows. To attempt to say that without a contract the MTA wouldn’t have a steady stream of people looking to become bus drivers is weak. 3. “Labor cost-controllability”. Is the most outrageous comment out of all? If a contract is so important to Labor cost-controllability then why is every major industry with union holdouts is falling by the waste side? Airlines, auto companies, etc. have been falling apart because of their union contracts and its labor cost-uncontrollability. The idea of a labor contract makes the cost uncontrollable not controllable. 4. “Rules for discipline that are agreed on both sides”, again are you kidding me? Dennis, it’s called an employee handbook that every employee signs off on when they take a job that tells them the rules of how they are to act. You don’t need a contract for that and millions of Americans take jobs everyday without one simply signing off on the employee handbook without the need of a contract. 5. “Efficiency of labor relations”? Dennis if the strike has shown anything, its that giving employees that don’t need one a contract is nothing but inefficient. Dennis, I cannot believe that you truly believe that a bus driver needs a contract. Now I wont argue that under current laws municipal employees are allowed to have one, that doesn’t mean they need one or that the city benefits from giving them one. As I pointed out every point you attempt to make at why it is needed is already done in America in every company without one. Dennis, Dennis, are you turning Democrat on me? Now, Why Does the NY Times Exist? Can you believe that the Times published the photos of undercover officers? I only wish the Times would act as professionally as I know our police officers would if called to the Times HQ or to Sulzberger’s house. One of the reasons Pataki coudln’t fire everyone after the strike was that, unlike Reagan, who had military air traffic controllers to replace civilian ones in 1982, to whom would Pataki turn to run the trains? Now while it could be argued that all of these things could be done on an individual basis (the free-rider issue could be fixed terms set by the MTA), collective bargaining, unlike regular at-will employment, also triggers legal requirements and protections for both sides under the Federal and State labor laws. The MTA is protected from illegal job actions taken by the union and union members, as we saw with the application of the Taylor Law. This is a much-sought after benefit, as most laws protect the employer from union activity. Also, there is a lot to be said for treating workers fairly in the bargaining process rather then negotiating deals with individuals or, more likely, setting unilateral terms on job-seekers. The body public has an interest in treating its employees fairly and the bargaining process guarantees this to be the case (or at least it is presumed). Further, the is nothing wrong with unions as an entity to balance power in the employer-employee context. Think of it this way, non-union, non-professional jobs typically pay much lower than their union counterparts. Many times this has to do with education and inability of workers to assess the market. Employers take advantage of such things in negotiations of salary and benefit terms with individual employees. While you may have had fun at your cleaning lady’s expense, my guess is that she is exactly the person unions were designed to protect – ones that could not effectively advocate on her own behalf and equalize power in the employer-employee relationship. Even though the strike is over and most of us can go back to getting to work on time, the matter of a contract for the TWU is still not over. Many people I come in contact with always ask me why is it the MTA, or any city agency for that matter, have a hard time coming to an agreement on a contract with the unions whenever the old one expires. As recent as last night, I was working late in my office when I ended up having a debate with the cleaning lady on the strike situation. Obviously she is a union employee and was pro-union so I was intrigued in getting her opinion and to see if I could sway her by having her look at the issue a different way. Knowing that trying to convince her that the pension the union gets is a good one would be a waste of my time, I thought I would change tact. Instead I took the position of “why does a bus driver need a contract to do his job”? Her initial response was because the worker needs protection from their employer who is always looking to take advantage of them. I immediately saw this was going to be difficult and that I wasn’t dealing with someone who I could explain Adam Smith and the invisible hand of capitalism too. Nonetheless, never backing down from a challenge, I continued on. My next question to her, was do you know the purpose of a contract? After some silence I explained that the purpose of a contract was to create an “agreement between two or more parties that creates for each party a duty to do something or even not to do something”. The key words in the definition that makes a contract work and why it is so hard to get a contract completed when it comes to city workers is “for each party”. If we think historically why contracts are used it is because both sides need protection from the other. Meaning if either side backs out of the deal the other side could be left with serious economic harm. For instance when Dell computer signs a contract with Intel for chips it is because Dell needs to be sure that a certain amount of chips will be available so they can build their computers and sell them. For Intel they need to be sure that they don’t spend millions of dollars to make chips for Dell and then have the company say they don’t want them. The contract protects both sides from harm. For athletes a contract is used so the Yankees don’t have to worry about Derek Jeter one day in the middle of the season going to Boston and Derek Jeter doesn’t have to worry about the Yankees cutting his pay if he goes into a slump. One last example is one almost everyone has experienced, which is the use of contract to purchase or rent a home. The lease on your apartment is so the tenet doesn’t have to worry about being thrown out in the street or have their rent raised for a certain period of time and for the landlord not having to worry that the tenet moves out having to go through the painful process of finding a new tenet. The point is that a contract is used because ‘each party” needs to be protected from the other. This is why getting a contracted signed by the TWU and MTA is so hard. The only side that is getting protection in the contract is the union, while the MTA doesn’t get anything. Nor because of the nature of the job does the MTA need protection from its employees beyond that the law already allows. If the bus driver or conductor wants to leave, the MTA will have no problem replacing that person with somebody else that would like to take that job. If we think of the contract that the TWU wants, every item is about what the union gets and nothing is about what the MTA gets. Now if the TWU were willing to put in the contract that, like Derek Jeter on the Yankees, TWU workers couldn’t quit for another job during the span of the contract without retribution then the MTA would have a benefit that would make a contract easier to sign. However this isn’t the case and TWU workers can leave at anytime. After this explanation to my union friend, I asked again do you still think a bus driver needs a contract? Though she stalled with her answer it still came out a stubborn yes because the worker needs to be protected. I then said yes that would be one reason for a contract and informed her that since the 1920’s there has been dozens of labor laws placed on the books to solve her concerns, but I asked again what is the MTA being protected against, which they are entitled to under the idea of a contract. Her response this time was silence, as she had no answer. In the end as I left for the day I didn’t know who had the most satisfaction, me knowing I stumped her on the need of a contract for city workers or her on the realization that her and her union brethren were doing a great job sticking it to the man. 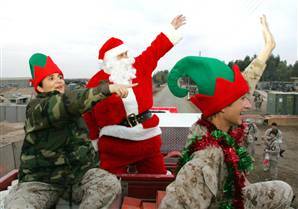 Take a moment over the next few days to send warm holiday wishes to our brave men and women fighting overseas. They’re thousands of miles from home, but each thank you note brings them a little bit closer to us. Best wishes to everyone for safe and happy holidays. It’s official; the TWU has voted 36-5 to return to work and is urging all TWU workers to do so. I would like to congratulate all New Yorkers for sticking it out and showing the TWU that a strike wouldn’t get them what they wanted. The TWU has caved and is going back to work so they can start negotiations again. Most importantly though I want to give a thumbs up to Governor Pataki for setting the precedent for future labor negotiations that you can’t “walk and talk at the same time”. negotiations, The New York Times reported on its Web site. running before that, according to the Times report.